Lost Atlases: Step Four: Making a map into (hopefully) a Superstar map. Step Four: Making a map into (hopefully) a Superstar map. My next attempt at a map. The smaller grid let me expand the map's focus and was more in keeping with what other Superstar entries turned out to be. Also, the scale is back to the usual 1 square equals 5 feet. There's a lot of changes in this map, from the artistic style to the content. Lets look at the art first. The most eye catching change has to be the introduction of color. For color I use Micron and Prismacolor calligraphy-style markers. Most craft stores should stock them. Most of the lines are 01 point, with 005 point for the really thin lines and 05 or 08 for the thick lines. I tried to keep the color choices logical - brown for wood, green for flora, blue for water and black for rocks. Its not always consistent - I have my palisades in black, but thats ok. Gravel is represented by a black dot pattern. Muddy slopes are represented by a brown dot pattern. The parallel dashes represent cliffs, although there is no place where I list the changes in elevation. One of the things I consider a mistake was the inclusion of a 'drip line' marking the entrance to the cave. This is deliniated by the black line across the river at the top of the map. On the plus side, the change in line thickness from surface to underground should be obvious. Layout-wise, I would like to point out some of the changes in the surface village. The river, for one, is wider and, as mentioned in the previous post, deeper. it spans almost the entirety of arch, meaning that the only way in now is by boat. Looking at the huts you still have the sage's hut to the right of the boat ramp, but to the left you have this new hut with a fence around it. This hut is for visitors who bring mounts. Just north of this hut is another hut with some shapes alongside of it. This was supposed to be the village blacksmith. The two huts above them were for temple attendants. The longhouse is only penciled in in this map because I was toying with changing its rectangular shape. The longhouse's purpose was morphing in my mind as I was drawing the map. Initially, I was thinking of having the villagers outside and the temple underground. But after awhile I thought that idea was awful. Screw our ancestors, say the villagers! We want to be safe! Put the temple outside and us inside! 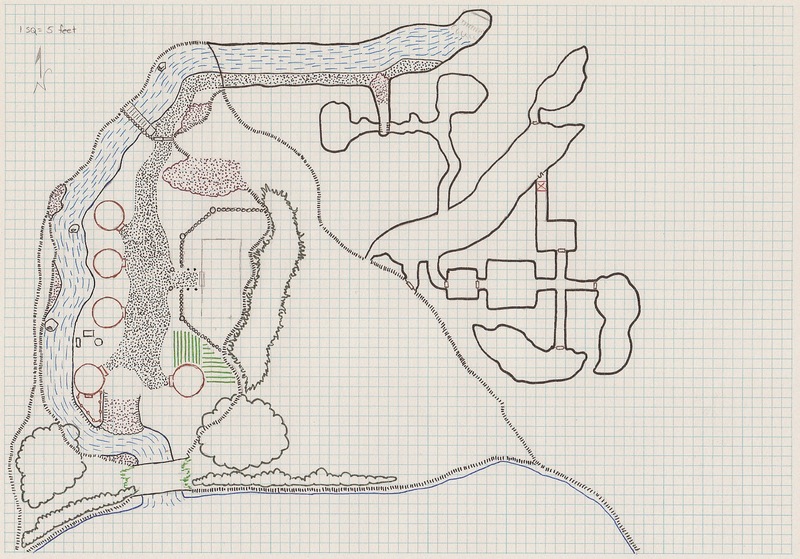 Which brings us to this whole new part of the map where I have fleshed out the underground. The river continues underground for dozens of feet before stopping at at short waterfall (which was only penciled in). The path, which previously had been rocky and uneven, is now a smoothed gravel bank. Two thirds of the way to the waterfall there is a side passage that goes for several feet before stopping. Where it stops it intersects a crossing passage. This crossing passage is 10 feet above the floor, requiring people to climb the walls to get up to it. From there, you can follow that passage south to a large, long room. Geologically speaking, this room was where the river used to flow through until it cut its way down to the current level. Now it serves as the major meeting room. To the south of that are several rooms for the majority of the tribe while to the north the chief has his own room. Lastly there is a door leading out into the upper plateau as well as a narrow crack that guards can use to look out across the plateau. Finally, this is the first map to really show part of the lake. We can also see better why this is such a great defensive location - this whole shoreline is all cliffs. Apart from climbing the cliff face, there is no other mundane way inside besides going through the arch. I found this version of the map to be the best one I'd drafted of them all. But I still had concerns about the usage of space (there is a lot of white space) and the fact that this was all just one flat map. I wanted some three-dimensionality. In the final map (which comes next) I try to address these issues.